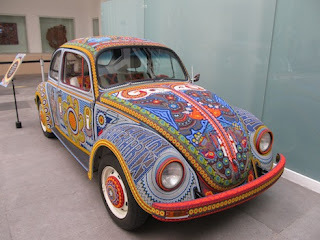 Puerto Morelos Blog: Huicol Volkswagen Art! So, I recently posted info about driving your car into Mexico. However, if you are going to look for a car here, perhaps you can snag this SWEET Volkswagen! I originally saw this car through a post on The Truth About Mexico. They had linked to the original article posted on Core77 which describes how the famous Huichol Indigenous Artists covered this classic in their incredible bead work. The article is definitely worth a read! After all, what says "MEXICO" more than a Volkswagen Beetle? And this particular one has "PUERTO MORELOS" written all over it!